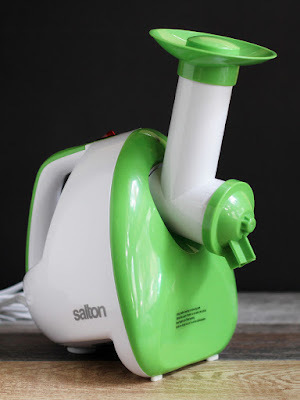 When the folks at Salton offered me a frozen dessert maker to test, I almost said no. I've seen the frozen dessert makers where you shove a frozen banana into the maw of the machine and frozen banana "ice cream" comes out the other end. I was vaguely intrigued by them, but not enough to buy one. I like room temperature bananas just fine. And I'm not afraid of regular ice cream. But when I saw that the Salton machine was not a one-trick pony, I decided to give it a try. You see, it also works as a grater and slicer - there are five grater cones for coarse, fine, and extra-fine grating as well as thick or thin slicing. I tried the frozen banana dessert a few times and I have to admit that it wasn't bad at all. A banana-peach combo was pretty good. It would be great if you're cutting back on dairy or trying to avoid ice cream. It's a nice cold dessert if you want something light. I think I'm going to buy some strawberries and give them a try if I see some good ones at the store. With this little machine, there's just not that much to wash. And the machine itself is pretty small, so it should store easily, too. I had a little trouble assembling it the first time - the way the tube fits onto the body of the machine feels like it's off-kilter, but once I figured it out, it wasn't a problem. It's a little noisy when it's running, but that's not a big deal either. This isn't a machine that's going to run for long periods of time - you're going to torment your bananas or shred your cheese, and that's the end of it. I haven't had this long enough to guess how long it will last, but it seems sturdy enough for what it's meant to do. Note: In the photo, I've got the mouthpiece of the shredder unit upside-down, but it still worked fine. That piece isn't actually needed, anyway. Who's it for: Gadget lovers. Or people who want to avoid ice cream but want cold dessert. Pros: Does what it's supposed to do. Small enough to store easily. Grater!!! Cons: Not a necessary device in the kitchen. Wishes: I wish the all the pieces could all store together in one neat package. I'll probably store it in its box to keep it all together. When a product offers to make my dish-washing and sink usage more efficient, I perk up just a little bit. I can always use a little more efficiency in my life. 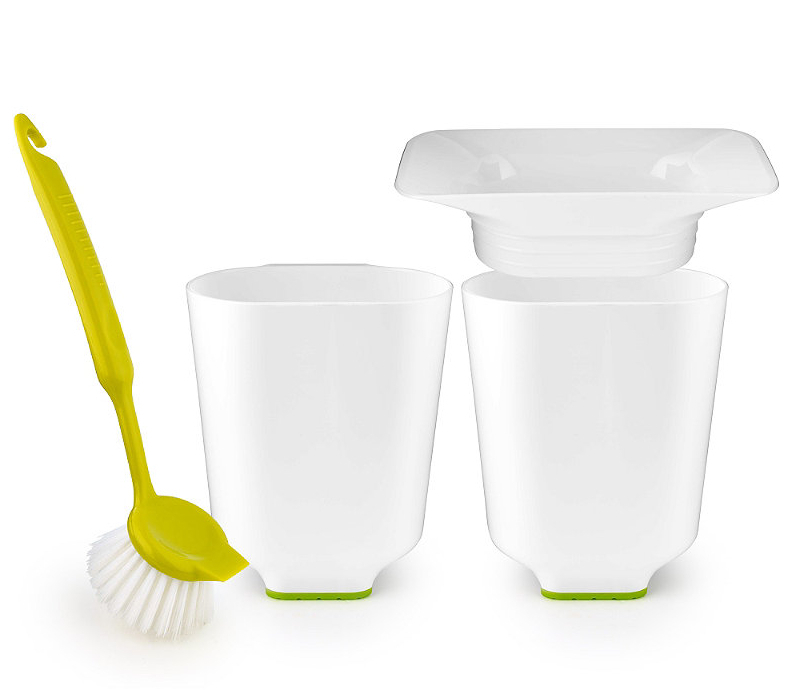 The Insink 4-in-1 device includes 6 pieces - a container with holes at the bottom for draining, a similar container with no holes, two suction devices to keep the containers in place in your sink, a funnel-like attachment that fits either contain to help you get things into the container (or it can be flipped to hold either of the containers upright without the use of the suction things), and a scrub brush. That sounds like a lot of stuff, but the important parts are the two containers. The one without holes is intended for holding soapy water so you can just dunk your sponge or dishcloth in there to keep from wasting soap when you wash dishes. You can also use it as a pre-soak if you have sticky foods on your spoons and knives. I've been living with these things in my sink to see if I actually use them. I haven't yet used the non-holed container to hold soapy water. but I have put silverware in it while they were waiting to be washed. I did find a genius use for the draining container. The suggested uses are for putting washed silverware to let it drain, or to wash and strain berries. That's not what I've been using it for. Instead I've been using it for food scraps that are destined for the trash. Particularly wet scraps. I can let them drain before throwing them in the trash so that I don't end up with a soggy trash bag. While I wouldn't rank these as a must have item (knife, spoon, cutting board, fire, pot ...) they are handy if you have sink-space to hold them. If you have a tiny sink, you might not want something extra sitting in it at all times, but since they nest, you could store under the sink and pull them out when you need them. Please note that these are a Canadian product, so the price will be different than what you see. As I'm writing this, the price in US dollars is lower. Who's it for: People who want better sink organization. Pros: They're tall and thin, so they don't take as much sink space as a bowl or strainer. Cons: They might not fit all sinks. If you decide to keep them in the sink at all times, you'll need to remember to wash - or at least drain - the container with no holes. Wishes: Colors to match people's kitchens would be nice. These are white with green accents. 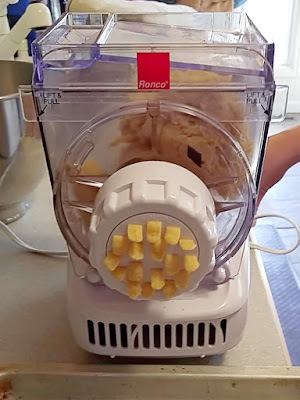 I've been wanted a stand-alone pasta machine for some time, so when the folks at Ronco offered me a product to review, I checked out their website and said, hey, how about that pasta maker instead? Yup, Ronco makes a pasta maker . I mean, what the heck. Might as well play with something I'm curious about, right? Here's the thing. I've got a pasta attachment for my stand mixer, so in theory I could use that. And I do, sometimes. But I've always thought it would be interesting to have one machine that would do the kneading and then just extrude the pasta. One thing to clean. So, the pasta machine arrived and I took it apart, washed it, and put it together again. The first time I assembled it, I had a little trouble figuring out which part went where, but now that I've done it a number of times, it's really pretty simple. 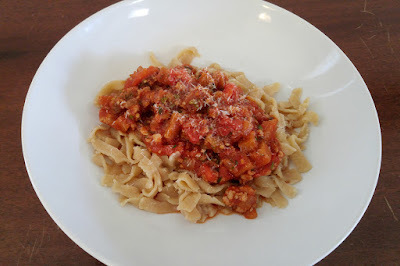 I took it for a test run at home, then brought it to a friend's house where we made pasta from some freshly-milled flour along with all purpose flour. My first impression of the machine was that there was a lot of plastic. Would it hold up? Pasta dough has to be pretty dense, particularly for extruded doughs. For some reason, the extruding process always makes the dough a lot softer (not just this machine, but my other extruder as well), and the dough tends to stick together. So ... the starting dough needs to be pretty tough to start off. The mixing chamber did seem to flex a bit, or maybe it's just that I was mesmerized at watching it knead. But it held up. Flexing is better than cracking. The motor didn't seem to strain at all, so that's pretty impressive. I have no idea how durable this machine will be over the long run. For now, it's working fine, but I've only made about a half-dozen batches of pasta in it. The motor is a tad noisy - not as loud as a blender, but not as quiet as a stand mixer, but this isn't a machine that's going to be running all the time, so the noise isn't a deal-breaker. The controls are simple. Flip a button one way and the dough gets kneaded. Flip the other way, and the screw-like kneader spins in the opposite direction, to feed the dough through the extruder. It's ingenious, really. The machine comes with a variety of extruding dies (spaghetti, fettuccine, rigatoni, linguini, and lasagna) for different shapes of pasta. I haven't tried them all yet, but the ones I tried worked just fine. There's also a tube that's used when you want to fill sausage casings with sausage, so this isn't a one-trick pony. Two tricks, basically. Speaking of tricks, making fresh pasta can be a little tricky. To start with, you have to get the dough the right consistency, and you have to let it knead long enough. That's something that comes with practice. But then there's the cooking. Fresh pasta cooks really really really fast. Like, it sees the hot water and it's done. The last batch of pasta I made was beautiful coming out of the machine, but I made the mistake of turning my back on it when it was cooking, and I overcooked it. To death. Not at all the pasta machine's fault. Just poor attention span here. Oopsie. Who's it for: Pasta people. Pros: It's one machine for kneading and extruding pasta. Flour and water are really cheap ingredients, so you can afford to make some test batches and if they don't work, you haven't wasted a lot of money. Then when you get good at it, you can add a more expensive item. Like an egg. Splurge! Cons: It takes a little practice to get the recipe right. Not the machine's fault, but it might take a few batches to achieve perfection. It will take even more practice if you decide you want to add extra ingredients to the pasta, like tomato, basil, squid ink, saffron, or anything else. But, hey, it's fun. Wishes: An integrated cutter for slicing the pasta into desired lengths as it exits the machine would be great. I use a knife, swiping from bottom to top, and it works fine. But a cutter would be awesome. I get all kinds of interesting items for review. MagnetJar qualified as interesting - a spice jar you could hang somewhere with a magnet. I really didn't think it through before I said yes. Because there's one tiny problem with any spice solution that has the spices hanging on the fridge. Herbs and spices should be stored in a dark place. Out in the open hanging on the fridge isn't a good spot. The company also suggests you can hang the jars on the stove hood, which is worse because you have both light and heat. But then I thought, gee, if these jars are that spectacular, maybe it would be worth hanging a sheet of metal inside a cabinet door to hang the jars. When the MagnetJars arrived, I had to clarify ... are these the final versions, or are they a prototype? Sometimes I get prototypes and test models, so I had to find out. Functionally, they work fine. They're a spice jar with a magnet glued to one side. They hold spices and they stick to metal surfaces. Job done. But they're not particularly decorative or elegant. They're not ugly. But no one is going to look at them and say, "Oh, those are pretty!" Looking at them from the front with spices in them, they'll look fine. But from the side, that magnet is bulky and not particularly attractive. Depending on where you hang them, you might not see the side. But you might, right? I have absolutely nothing against things that are function over form. Function is actually more important to me. So ... these work. Pretty much like any other spice jar I own. My original thought was actually pretty good. If you hung a big metal sheet inside a pantry door, these would be nice stuck to the inside of the door. As for leaving them out in the open ... you're really better off having your herbs and spices safely inside a cabinet. These would also be useful in a garage or craft room to stick on metal shelving to hold small screws, washers, nuts, and other small parts. Who's it for: People who need more spice jars and who want to hang them up. Cons: They're not particularly attractive. Wishes: Opaque jars would make so much more sense, like maybe opaque white with a chalkboard-painted circle to write on. Have you ever made sauerkraut? I'm not asking if you've ever cooked it. I'm asking if you ever started with cabbage and turned it into sauerkraut. I've made sauerkraut a few times. Usually in large quantities. Like in a 5-gallon crock. So when I saw that the Kraut Source product allowed me to ferment a much smaller amount of sauerkraut, I knew I had to try it. Actually, I had been wanting to make kimchi for a while, and I only wanted to make a small quantity, so that was the first thing I thought about making. But then I decided to a quart of sauerkraut instead. I'll be making the kimchi later. Maybe a pint. While this is a great idea for people who only want to ferment a small quantity of something, it's also a great way to test a recipe - make a pint or a quart before you commit to that giant 5-gallon crock of kraut. To be clear, while you can make a pint or a quart of fermented foods with the Kraut Source, if you want a larger quantity, you can use it on any jar that has a wide-mouth top. I know there are half-gallon jars for sure. The Kraut Source came with a small recipe booklet, but there are more on the website, so I looked there to see what was interesting. The first sauerkraut recipe I saw was pretty basic, with just cabbage, salt, and caraway seeds. I decided to ditch the caraway seeds. It's not that I don't like caraway, but if I it them in my kraut, I can add it later. So that left me with 1 1/2 pounds of cabbage and 1 1/2 tablespoons of salt. Easy peasy. And that's it. Just cabbage and salt. If you're wondering, 1 1/2 pounds of cabbage was about 3/4 of a small head of cabbage. I used the last part of the wedge to make cole slaw. And that 1 1/2 pounds of cabbage fit into a quart jar, with room at the top, just like it should be. At first, it doesn't seem like it's going to fit, but as the salt does its magic, the cabbage softens and releases water and it can be shoved into the jar. Then it just has to sit for a while - a week or two - and you just have to make sure the moat doesn't dry out. And that's it - it's sauerkraut. If you prefer, you can keep it fermenting for a little longer, or you can put a regular lid on it and refrigerate it for later, or you can cook it right away. The Kraut Source device is pretty ingenious. There's a flat piece that sits on top of the cabbage, and there's a spring that pushes the flat piece down to keep the cabbage submerged under the liquid. So you don't need a separate weight on top of the cabbage. The lid has a moat and a cap that create a water-seal airlock that allows the carbon dioxide to escape. You fill the moat about halfway with tap water when you set it up, and then top it off during the fermenting time, if needed. Hand-rigged systems need to be "burped" to release the gas every day to avoid explosions. Your small batch of sauerkraut or an open-crock ferment is probably safe from a major blow-up, but releasing that gas is an important part of the process. This little kit is everything you need to make sauerkraut or other fermented foods in one neat package. And since it's made from stainless steel, it's easy to clean. You can even wash it in the dishwasher. The only part of the Kraut Source that you might need to replace after a lot of use is a silicone gasket. The good news is that it comes with an extra one. So this should last a long, long time. I got the more basic kit with just the Kraut Source device. There's a slightly more expensive Kraut Source Kit that includes a quart jar, a 4-ounce pack of Celtic sea salt, and a pack of organic spices that are needed for the golden sauerkraut recipe. Who's it for: People who want to try fermenting. 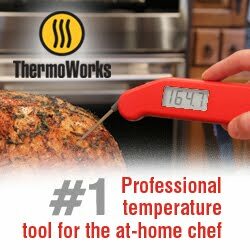 Pros: Made from stainless steel. Easy to clean. Elegant design. You can make small quantities. Wishes: It would be great if there were more recipes available. I'm always looking for bowls, plates, storage containers, and cute decor that I can use in the kitchen, for photos, and ... for actual serving and storage. So I thought the berry baskets from Crisp were just too cute to say no to. They're colorful, and they're a good size for holding fruits and other food. And they're cute. Okay, I said that. But look at them. They're just sweet little baskets that you could use for food or for decoration. I mean, I've never really had an urge to buy fake fruit, but I could see buying some just to put in these baskets to have them sitting somewhere and looking decorative. They seem sturdy so far, and they nest neatly for storage. They've got holes for airflow or for drainage if you want to rinse berries in the baskets. They're definitely more sturdy than the mesh baskets that berries usually come in. Who's it for: People who want some colorful containers for berries and stuff. Pros: Good size. Nice colors. Drainage and airflow. Nesting. Cons: Okay, they're containers. They're not much bad to say about them unless you don't happen to like the shape or color, right? You couldn't put soup in them. Hah. Wishes: More colors, please. I do love the colors these come in, but if there were a dozen colors, I'd probably buy another set or two. So, a holding cell sounds like a place the police put you, but that's not what this is about. It started when a company contacted me about how I could use my iPhone more easily in the kitchen. "Sorry," I said, "I don't have an iPhone. Mine's Android." They said, oops, this works with Android or any phone. It's great. You can use it in the kitchen to use your phone without getting it dirty. It's great. So I told them to go ahead and send it. I don't use my phone in the kitchen a lot, but it might be useful to have a way to prop it up. When My Holding Cell arrived, I saw that it was promoting how easy it is for use in the bedroom. You slide part of it between mattress and box spring and then you can use the phone or fold it against the mattress to keep it out of the way. I can't tell you if that works or not. First, I don't use the phone in bed. I sleep in bed. Second, I have a platform bed, and there's no possible way it would work, even if I wanted it to. So ... to the kitchen I go. It suggests that for kitchen use, you should screw the holder to a wall. Oops. Slight problem there. The only available walls in my kitchen are under the cabinets, and that would be less than useful for trying to read what's on a phone screen. And if I am working with my phone in the kitchen - to read a recipe perhaps,or to monitor a lively Facebook conversation - I'd want it to be able to move around. Have it near the stove if I was busy stirring a risotto, or over by the food processor if I was tossing things in there. Having it hanging in one place might be convenient if I had one workspace. But, again, that's not going to work for me. So, I tried figuring out if I could use it to hold the phone while it was sitting on the counter. Maybe it's because I have a larger phone and it made the whole shebang top-heavy, but the only way it was stable was to put something on the "foot" so it didn't tip, and it didn't hold my phone very securely in that position. I have a little folding gizmo that works better in the kitchen. Honestly, this thing is designed for that use in the bedroom, and maybe that's where it should stay. Who's it for: People who use their phones in bed. Or who have one place in the kitchen where they want to attach their phone to the wall. Pros: I can see how it might solve a problem. Cons: I'm not sure how comfortable it would be using the phone in bed the way they suggest. If you give it a try, let me know. Wishes: Would have been cool if it could have held the phone securely on the counter. Okay, I think this is a first. 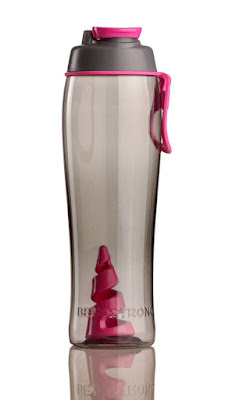 I got a product in order to do a recipe (which I already published) and now I'm doing a review. No review was required, but I'm kind of giddy about my new toy, and I'm also including a few words about the wheat I bought. Because what I got is a grain mill. Yup. I'm grinding grains. 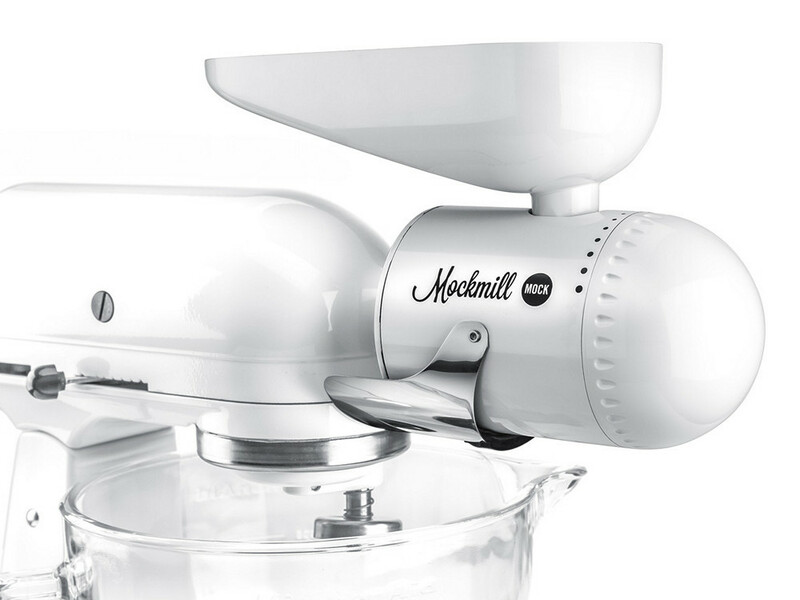 The mill (a MockMill) attaches to a KitchenAid stand mixer , just like any other attachment, and it has stones that grind the grains from super-fine to chunky, depending on what you want. The mill is super-easy to use. Just attach it to your stand mixer and pour the grain in and let it grind. The mill is designed so it spews the flour neatly into the KitchenAid work bowl, but I've also used a regular bowl when I wasn't planning on using the mixer to do the kneading. I had one slight problem with the MockMill when it wiggled its way loose from my mixer during the grinding process. After using the mill on a friend's machine, I realized it's an issue with my particular mixer. With the same grain, it barely wiggled when it was attached to her mixer. But, that's something to watch out for the first few times you use the mill, until you know whether your mixer is wiggly or not. Here comes the confession. I'm actually not a huge fan of whole wheat bread. I mean, I don't hate it. But when I want bread, I usually want white bread. Yes, I know whole wheat is better for me than white bread. But ... sigh ... I get plenty of fiber and nutrients from other foods. And I don't eat all that much bread. Not really. But here's the weird thing. I really really really love the bread I've been making from freshly ground whole wheat flour. I can't really say what the difference is, but I look forward to eating it. It's not, "Oooooh, I'm going to make a tasty sandwich that happens to be on whole wheat bread." Instead, it's ... "hmmm, I think I'll have some whole wheat toast." So let's talk about grains. I bought some bulk wheat berries to start off with, then I bought some more on Amazon from Palouse Brand . And I'm really happy with their products. I'll be ordering from them again, for sure. Mmmmm. Wheat. Besides wheat, they sell dried beans, lentils, and split peas. If you're looking for wheat or other products, give them a look. I'm not saying that I won't be trying other brands and other products. Heck no. Now that I've got a grain mill, I'm going to be seeking out different types of grains and different varieties of those grains, and Palouse doesn't sell everything I could possibly want. I didn't see rye, for example. Right now, in the wheat category, I already have hard white summer wheat, hard red winter wheat, hard red spring wheat, and soft white wheat. I'm going to be grinding spelt and farro eventually. And rye and oats. And can grind rice or make cracked rice if I want to. Maybe I'll try to replicate steel cut oats. I mean, I've got a mill. I'm going to use it! 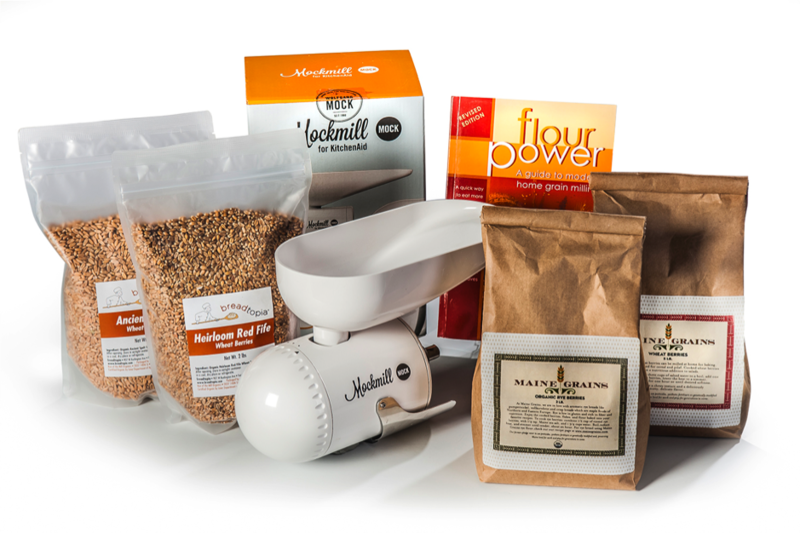 If you happen to want a grain mill and you're interested in the MockMill, there's a special offer right now on a package that includes the mill, a cookbook, and some grains. The package normally sells for $259, but if you use the code cookistry when you check out, you'll get an $80 discount so you only pay $179 - which is a good deal considering the MockMill all by itself costs more than that. There are actually a couple different packages available, so make sure you look at what's offered and pick the one you like best (the differences are the grains). You need to go to the summer promotion link, but you'll only get the discount if you use that super-seekrit code at checkout: cookistry. Don't forget to do that, or you'll pay a lot more. Who's it for: Let's face it, a grain mill is definitely a specialty item. The Palouse Brand products don't need to be grounds, so those could be for anyone. Pros: You can grind any grain you want, whenever you want! Eat more grains! Mmmm ... food! Cons: Not everyone is going to want to grind grains. Wishes: Seriously, so far I'm happy with both the mill and the grains. 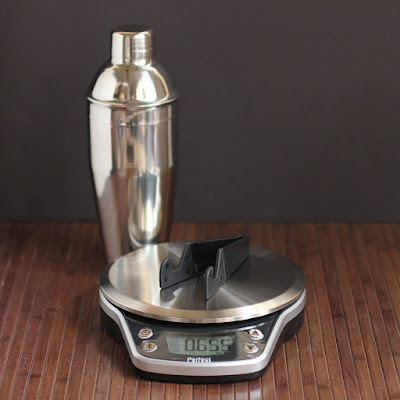 Source: I received the MockMill from the manufacturer for a post on my recipe site; I was not required to post a review. I bought all of the grains I've been grinding. There are affiliate links in this post; it doesn't cost you more, but I get paid a little for your purchases. Go to this post to WIN a Mockmill! Ends 8/23/2016.